India's position was enunciated by External Affairs Minister Sushma Swaraj at the historic India-Central Asia Dialogue. India on January 13 said it was committed to the economic reconstruction of Afghanistan and to promote an inclusive "Afghan-led, Afghan-owned and Afghan-controlled" peace and reconciliation process in the war-torn country. 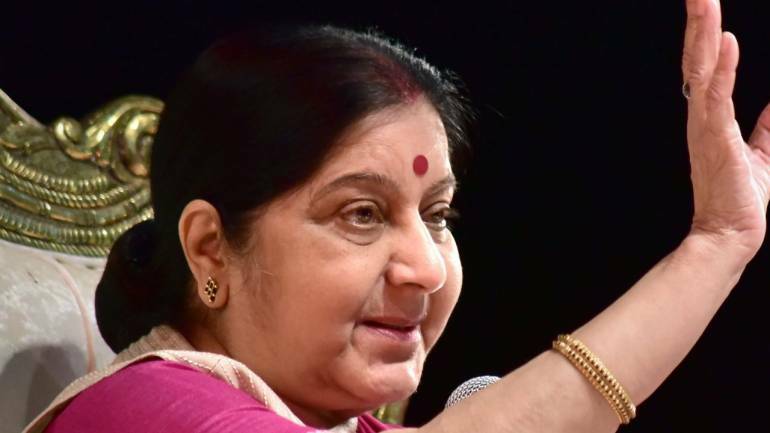 India's position was enunciated by External Affairs Minister Sushma Swaraj at the historic India-Central Asia Dialogue, with the participation of Afghanistan, which focussed on a plethora of regional issues including enhancing connectivity to the country ravaged by terrorism. "I would like to specifically point out that our region is facing serious challenges posed by terrorism. India, Central Asia and Afghanistan are societies which are tolerant and plural. The ideology of hate which the terrorists would like to spread has no place in our societies," Swaraj said while addressing the first session of the dialogue. "We also need to ask that who these terrorists are, who funds them, how do they find sustenance, who protects and sponsors them," she said. "No business development, no investment can take place in a country suffering from terrorism. To promote business development in our region, we agreed to fight the scourge of terrorism together," Swaraj said, adding that terrorism seriously erodes all avenues of development which a country can have. Development partnership has emerged as an important component of India's engagement with Afghanistan. The minister offered to extend this partnership to Central Asia as well, where India can bring countries closer by taking up concrete projects under lines of credit and buyers' credit, and by sharing its expertise. She said more efficient connectivity will lead to the full realisation of the growth potential of the region. "We are geographically close and, in terms of air connectivity, only about three hours away," she said adding the time has come to develop more efficient transit routes, as well as to better utilise existing opportunities and find innovative solutions. India has proposed the setting up of the 'India-Central Asia Development Group' to take forward this development partnership between India and Central Asian countries. The group will come up with concrete proposals, Swaraj said. She mentioned the joint efforts of India, Iran and Afghanistan that have led to the development of the Chabahar port in Iran as a viable route to connect to Afghanistan and potentially to Central Asia. "Chabahar provides a shining example of what strong partnership can achieve to overcome any obstacles," she said. India has already sent a very substantial quantity of wheat to Afghanistan using the Chabahar port. Last month, an Indian company opened its office and took over operations at the Shaheed Beheshti port at Chabahar, she said. India is also looking to develop the Chabahar-Zahedan railway link which would bring it close to the Zaranj-Delaram road link which India has already built in Afghanistan. India has also put forward several proposals towards enhancing cultural cooperation and training programmes for capacity building for candidates from Central Asia. Swaraj said "India supports the people and government of Afghanistan in their efforts to build a united, sovereign, democratic, peaceful, stable, prosperous and inclusive nation. India supports all efforts for peace and reconciliation in Afghanistan which are inclusive and Afghan-led, Afghan-owned and Afghan-controlled". These efforts should preserve the gains of the last 18 years. The violence and terror imposed on Afghan people should end. It should strengthen unity, sovereignty and territorial integrity of the country, she said. India is extending development assistance to Afghanistan of over USD 3 billion, focused on reconstruction, infrastructure development, capacity building, human resources development and connectivity. Under the 'New Development Partnership' launched in September 2017, new projects are being taken up including Shahtoot Dam drinking water project for Kabul city, low-cost housing in Nangarhar province, 116 High Impact Community Development Projects and a host of other infrastructure development projects. Over 3,500 Afghan nationals are trained and receive education in India every year, she said. Bound together by shared history and cultural linkages, India and the Central Asian states look forward to the dialogue as an important initiative to enhance their cooperation in wide-ranging spheres including exploring ways to substantially enhance India's economic involvement in business and development sector of Central Asia, the MEA had said. Swaraj arrived in the ancient city of Samarkand on January 12 on a two-day visit to attend the first-ever India-Central Asia Dialogue. The MEA earlier said that the first-ever India-Central Asia Dialogue, with Afghan participation, "will take India's outreach to the region to a new high." Foreign ministers of Kyrgyz Republic, Tajikistan and Turkmenistan and the First Deputy Foreign Minister of Kazakhstan are also participating in the dialogue.